It's been pretty glorious weather where I live recently. The smell of optimistic barbecuing has filled the air, and the menfolk have whipped off their tops. One of these is a consistently good thing (barbecues), and one can be a little hit or miss (naked torsos). Ah well. You win some, you lose some, eh? The upshot is, I now want to eat nothing but burgers, come rain or shine. These chicken burgers are packed with zesty, fresh flavours - ginger and lime are brilliant pals, and the sesame-breadcrumb crust provides a bit of interesting crunch. I fried mine, but you could cook them under the grill if you prefer. They're really juicy and delicious - they'd work well as meatballs, too, served with noodles and a little soy sauce. In a large bowl, mix the mince, spring onion, garlic, fresh ginger, ground ginger, lime juice and pulp, chilli flakes, egg, and salt and pepper with your hands. Combine the breadcrumbs and sesame seeds in a bowl that's big enough to dip a burger-sized, um, burger into. Put the flour in a separate, similarly-sized bowl. In a large frying pan, heat some oil. While it's heating up, make your first burger by taking a dollop of meat mix (the size is up to you - I went supersize! ), rolling it into a ball, then flattening it into a disc. Dip into the flour, sparsely coating the outside, and then into the breadcrumbs, making sure all exposed bits of burger are nicely covered. Pop in the pan, and fry for about 5-7 minutes, flipping over halfway through (the length of time you fry for will depend on the size of your burger). Keep making and adding burgers during this time. Remove each from the pan as it's ready, and drain on a bit of kitchen roll if necessary (I didn't think it was). 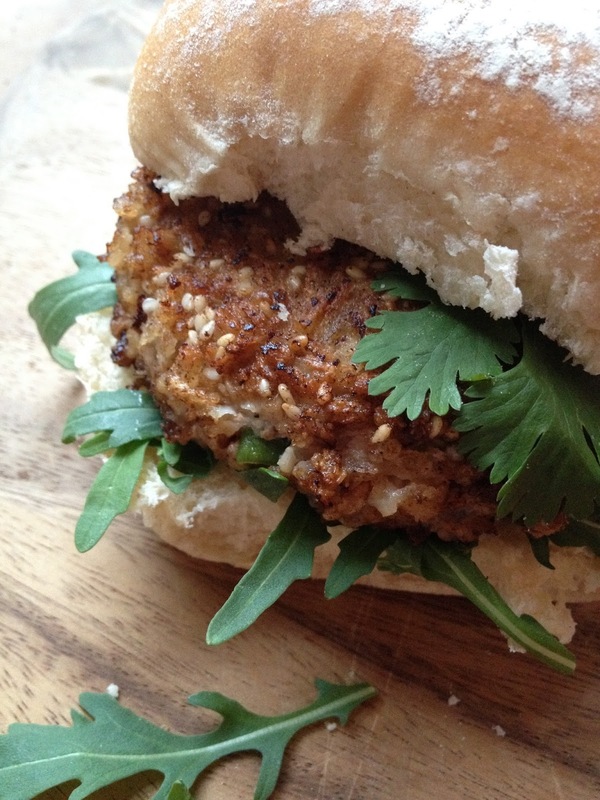 Serve on buns, with some coriander and salad leaves for greenery. MMM! going to convert to gluten-free with GF panko and GF flour - looks delish! I'm having mine with corn relish and sweet chilli sauce. Thanks!